The Bible Mentions King Jehu of Israel. The Black Obelisk mentions Jehu, king of Israel in cuneiform script. 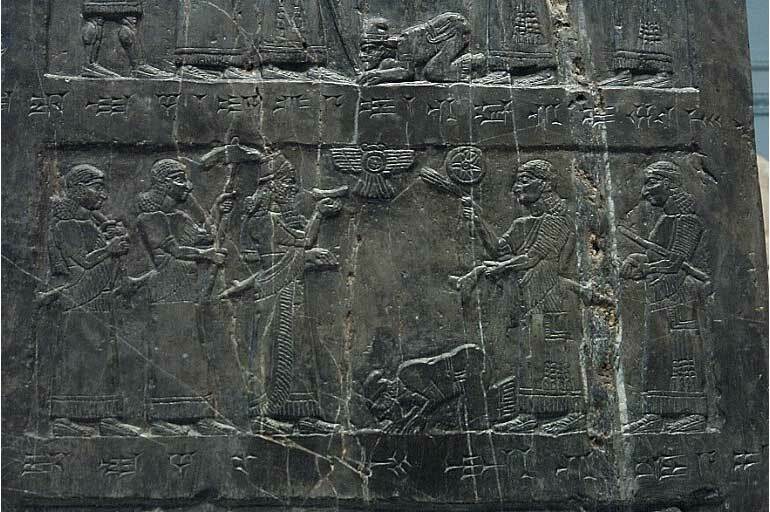 On the panel Jehu is bowing before Shalmaneser III, king of Assyria and presenting him with gifts. The Jehu Relief on the Black Obelisk is the only representation of an actual Hebrew king. It was discovered by archaeologists at the site of Nimrud in Northern Iraq. The Bible mentions Jehu by name in 2 Kings 10:31. Jehu is the king who ordered the death of Jezebel in the Bible. "The tribute of Jehu, son of Omri, silver, gold, bowls of gold, chalices of gold, cups of gold, vases of gold, lead, a sceptre for the king, and spear-shafts, I have received." 2 Kings 10:31 - "But Jehu took no heed to walk in the law of the LORD God of Israel with all his heart: for he departed not from the sins of Jeroboam, which made Israel to sin." 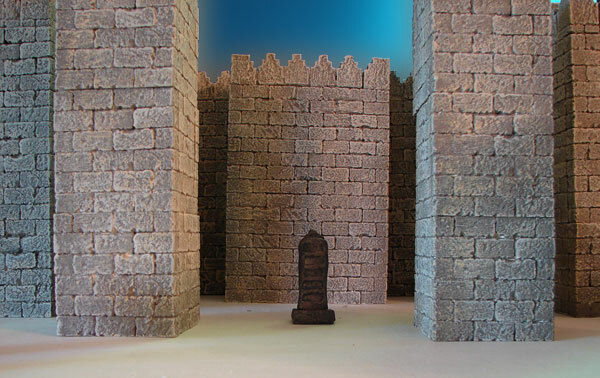 The archaeologist Henry Layard discovered this black limestone obelisk in 1846 during his excavations of the site of Kalhu, the ancient Assyrian capital. It was erected as a public monument in 825 BC at a time of civil war. The relief sculptures glorify the achievements of King Shalmaneser III (reigned 858-824 BC) and his chief minister. It lists their military campaigns of thirty-one years and the tribute they exacted from their neighbours: including camels, monkeys, an elephant and a rhinoceros. Assyrian kings often collected exotic animals and plants as an expression of their power. The tribute of Jehu, son of Omri: I received from him silver, gold, a golden bowl, a golden vase with pointed bottom, golden tumblers, golden buckets, tin, a staff for a king [and] spears. Shalmaneser III came to the throne of Assyria in 860 BC and reigned until 825 BC. He was the son of the mighty conqueror Ashurnasirpal II and the first Assyrian king to go to war with Israel. 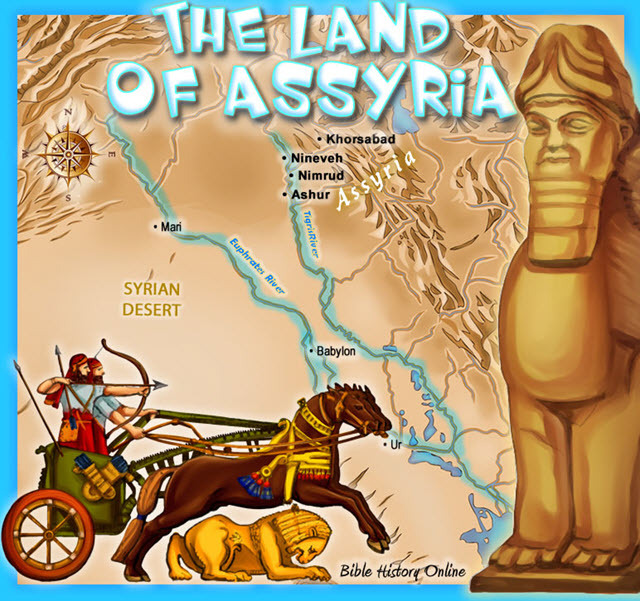 He created massive building projects and expanded the land of Assyria into an empire. - Black Limestone Obelisk of king Shalmaneser III of Assyria (841 BC). 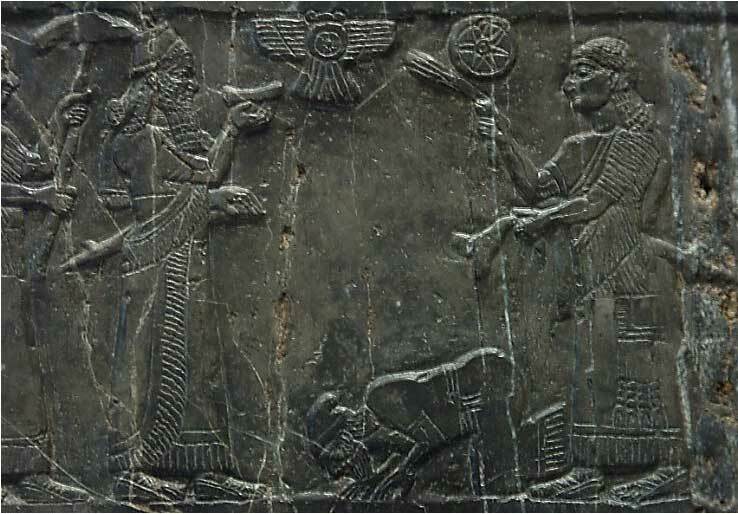 - The Jehu Panel depicts king Jehu of Israel bowing before the king of Assyria. - This is the King Jehu of the Bible (2 Kings 9-10). - This is the only representation of a Hebrew king from ancient times. - This gives us some idea of Israelite dress in old testament times. - There are a band of 13 Israelites with precious gifts. - The Black Obelisk stands 197 cm (6.5 feet) tall. - Shalmeneser III reigned from 860-825 BC. - The Black Obelisk is from the Neo-Assyrian Period (1000-612 BC). - Excavated at the site of ancient Nimrud (Calah) in 1846. - Shalmeneser III was the first Assyrian king to go to war with Israel. - Ancient Nimrud was excavated by Austen Henry Layard of Britain around 1846. 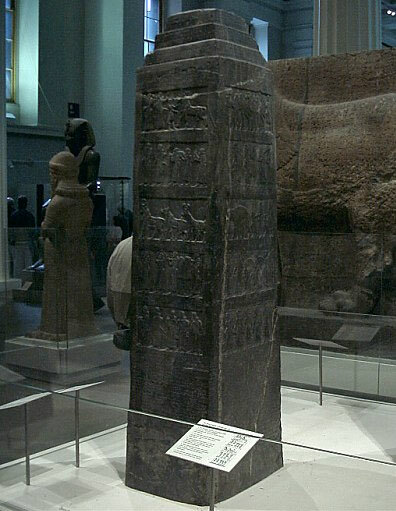 - The Black Obelisk is currently at the British Museum. - Nimrud (Kalhu) was Shalmeneser III's capital city (Northern Iraq). "Opposite the monarch two grooms-in-waiting have taken up their stance, one waves a fan and a censer, the other, carrying a scepter under his arm, has his hands respectfully clasped in front of him. Then comes a bearded officer with an attendant, leading a procession of 13 Israelites laden with precious gifts for the Assyrian king. All the Israelites are bearded, and wear peaked caps and bandeaux. A long robe with fringes round the hem and a girdle, a long cloak with fringed end thrown over the shoulder, and pointed shoes complete their outfit."